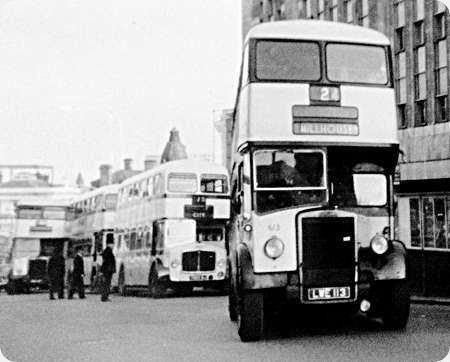 There’s a bit of a bus jam in Sheffield High Street on 9th October 1965 as 613, one of the large batch of A fleet all Leyland PD2s leaves the stand for a trip to Millhouses. It takes three Inspectors to peruse the Alexander Regent V in the background, hope they move out of the way before the member of the small batch of 1952 all Leyland PD2/10 manages to squeeze past the back of the queue and continue its journey. This little scenario (minus Inspectors) was re enacted last Wednesday in exactly the same place as I passed by – quite a coincidence! Sheffield’s all Leyland PD2s all put in a good innings, at 16 years old 613 looks in fine fettle. Strange how Sheffield used two different liveries for differing bodywork designs. The three blue bands was probably the standard but most of the Roe bodies and these Leylands had blue around the windows. The big city fleets tended to be very standardised and bordering on the boring with large batches of buses that looked more of less the same. Sheffield was the exception as they purchased smaller batches of widely varying vehicle types right up to being absorbed into the PTE. A very interesting and always well turned out fleet. We had civic pride in those days. On the subject of civic/local pride First has repainted buses in Leeds and Bradford into former operators liveries. For some reason these are always immaculately turned out by their respective garages unlike some of the standard liveried stuff Makes you think eh. Other Chris H – Have found a Bradford one – http://tinyurl.com/h2n27cm – very smart! A great photo Ian, brought back lots of memories! Having spent what might be described as my formative years in Sheffield I can only endorse the comments made about the variety of the fleet, though our local route 61/63 was almost always provided with the Roe bodied Leyland PD3s which replaced the trams. From memory, the buses were usually well maintained and clean inside (apart from the nicotine stained ceiling of the upper deck before smoking was banned)! Perhaps the presence of a conductor made a difference? Now living in Dorset and using First in Weymouth, I have to say that the buses are usually clean inside and out as well. The images of the First fleet in Sheffield using the older liveries just goes to show how awful the current so-called liveries are. The old ones had style and dignity, and looked good as well. Nice photo! I visited relatives in Sheffield in the 1960s so delighted to see this. Was the very small plate on the radiators a note that the bus was `antifreezed`? Can’t remember! 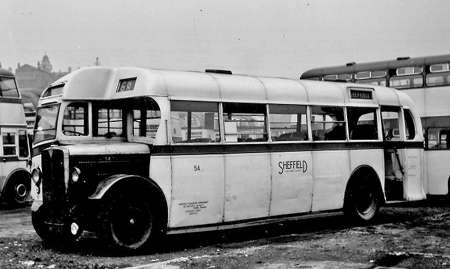 The ‘three blue bands’ vs the ‘blue window surrounds’ wasn’t the only variation to be found in the Sheffield livery either. 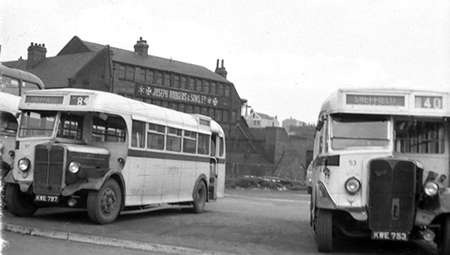 On first repaint, buses had their roofs painted smudge grey instead of the cream they were delivered with, as seen in this photo of the same all-Leyland PD2, 613, laying over in Castlegate, alongside the River Don. I’ve heard it said that the shade of grey was actually derived from mixing the residue of the blue and cream paint tins. 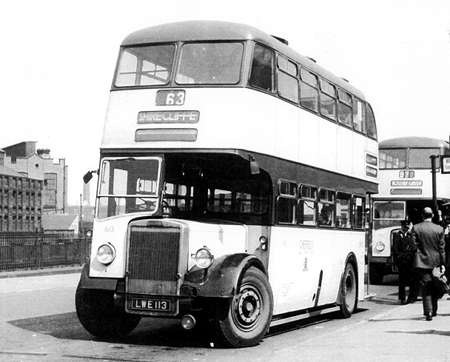 In Ian’s photo of the bus, taken in its later years, the bus is seen to have had its original cream roof restored, part of the modifications made to the livery in the ‘Humpidge’ era of management. When C.T. Humpidge, formerly at Bradford, took over as General Manager from R.C. 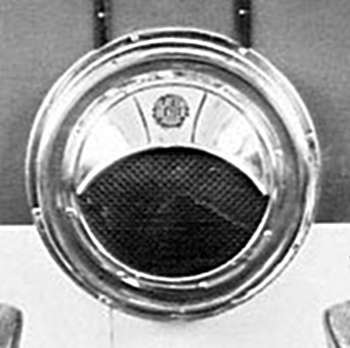 Moore in 1961, he made moves to do away with the practice of painting the roofs grey, and Roe bodies eventually lost their blue window surrounds, although intriguingly none of the Leyland ‘Farington’ style bodied PD2s so treated ever did, and retained their ‘blue window surrounds’ livery to the end. Humpidge also had matt black applied between the destination apertures to form a so called ‘consolidated display’, a move that still generates fierce debate amongst some older Sheffield enthusiasts even fifty plus years later!! If the ‘consolidated’ destination was controversial, why did they not go all the way and just have a single line? Almost all photos that I have seen have one of the two screens showing blank and I have yet to find a reason for two of them being fitted! David – from memory there were a few destinations that required the use of both screens, Dore via Brocco Bank and Beighton Handsworth are two that come to mind. Also I think the lower blind had (generally) City services whilst the longer distance services (generally) appeared on the upper blind. Note that on the photo above from Dave, Shirecliffe is on the top blind (exception proves the rule) whilst on the bus behind, 97 Southey Green used to have via Longley Lane on the lower screen hence its appearance on the top screen. Fulwood via Rustlings Road was another, Ian. I remember being fascinated as a kid, on shopping trips into the city, seeing these PD2s storming along Fargate showing Roscoe Bank or Brocco Bank, they seemed like exotic destinations to me at the time, I don’t know why! To emphasise Ian’s point, both blinds were used on a number of routes, 61/63 Beauchief and Woodseats Circular with Circular in the lower display spring to mind together with 74 Greystones Norton. So I think both blinds were in pretty frequent use. Or neither in use – instructions for the Stocksbridge locals were to "show blank" . . . despite "Garden Village" being available. If you follow this link http://forum.sy-transport.co.uk/thread/13424/destination-blinds-lists (South Yorkshire Transport Forum, History, Destination Blinds) you’ll find listings from various destination blinds, including (if you work through the pages) various Sheffield Transport upper and lower and Y-type blind sets. 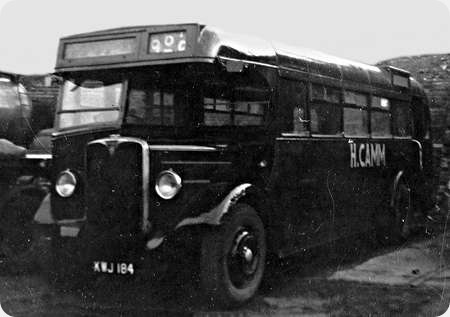 This bus was one of a batch of nine supplied new to the B fleet as fleet number 1355. This batch were extensively used from new on service 41 to Hackenthorpe where there was a large new housing development. They were the first rear engined double deckers for the B fleet and were the final batch with rear destination displays before reversion to rear route numbers only. 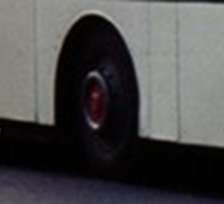 Following the absorption of the B fleet in 1970, the bus was renumbered to 225. 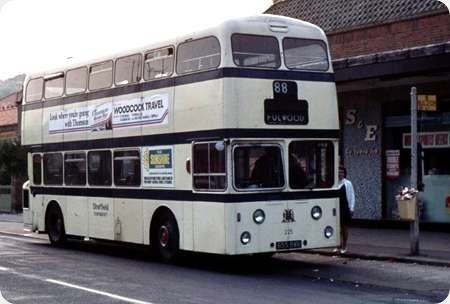 Here it is seen at Fulwood terminus of service 88 which replaced the former tram route. Fulwood was the elegant part of the City! The date was 26th August 1973, the bus looks smart and as always the Sheffield livery helped to disguise the box shape of early rear engined deckers. It carries the final pre PTE fleetname introduced I think by General Manager Noel Macdonald. It still has a full set of Leyland wheel embellishers although eleven years old. Note the Sheffield bus stop flag, quite distinctive in the days before the nationally standardised type. I always thought the original Atlantean and Fleetline designs from the MCW group had a certain symmetry that was lost with the later moves to graft on curved or vee windscreens and peaked domes which always looked like a bit of a lash up to me. Yes the design was ‘boxy’ but it was simple seemed to work. The PRV/Roe early incarnations though were absolutely dreadful with the top heavy Bridgemaster upper deck characteristics. Of all the body builders on the early rear-engined buses only Alexander really got it right with the Glasgow design. I agree with Philip regarding the style of the early MCW Atlantean/Fleetline bodywork. I have always thought it to be a rather good, quite attractive design which was most appropriate for the then ground breaking rear engined buses. But are these wheels with their embellishers red- as they should be- or blue, reputed to have been in "celebration" of a rare & brief Conservative takeover of the city council in 1968? Bit of history here. Best I can do I’m afraid. Both red AND blue would you say? Red centre on a blue wheel? I lived at Hackenthorpe when these were introduced. What a revelation they were replacing the AEC batch 190 -198. 1261-1263 + Leylands 159-161. At eve rush hour when full standing by the driver you would marvel at the gear changing (a lollipop in a fag pkt). When new as joint omnibus fleet they did not carry the cities coat of arms! When did 225 receive it? Must say it wasn’t long before I missed the wonderful exhaust note of the AECs!!! 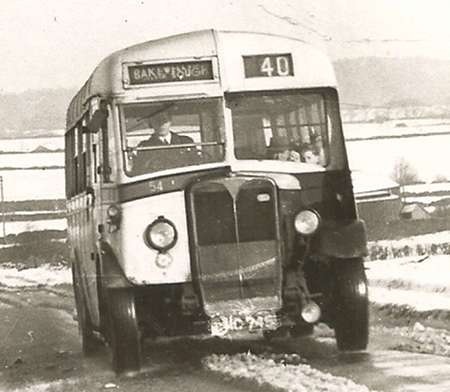 NB I am collecting photos of any buses on the 41 route in 50s/60s if anyone can help? I preferred the Park Royal body from around the same period. I also lived at Hackenthorpe when 1350-1358 were new. The upper deck of 1357 was totally destroyed in a fire in the late 60s, while operating on the 41 to Hackenthorpe. It received a new Park Royal body and re-entered service in 1968.